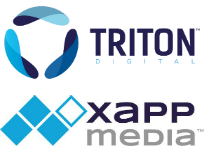 Triton Digital announced today that it will represent XAPP ad inventory in JAX, the mobile advertising service created in january by XAPPmedia and jācapps, the Jacobs Media app development company. JAX is a premium advertising service for the mobile audience. The alliance integrated the XAPP Interactive Audio Ad Service into the jācapps mobile platform. All this pivots on XAPP technology called XAPP Ads, a creative platform for mobile advertising which delivers voice-activated audio commercials. When hearing a XAPP Ad, the listener may perform a call to action, such as opting into an email delivery, making a phone call, or downloading an app. The conceptual heart of XAPP Ads is the ultramobile consumer, a XAPP coinage referring to mobile streamers who don’t look at their screens. Assuming that scenario as a common use case, XAPP ads enable marketers to generate direct response leads without requiring the listener to look at or touch the screen. Lisa Namerow, SVP of Business Development and Publisher Relations at XAPPmedia, agreed that Triton will bring existing demand into the JAX platform. “Triton has been on the street, taking the temperature of the market regarding the interest level in XAPP,” Namerow told RAIN News. “They’ve gotten a great response. We’re thrilled to be aligned with a partner who is passionate about the product. JAX is naturally available to jācapps users, over 300 apps, most of which belong to radio stations. Non-jācapps mobile apps can get on the platform, too. “It’s high ROI, low lift,” said Namerow.